The authors of the book The Struggle: Mom and the Summertime Blues are from Middle Georgia. The authors consists of a mom and her four daughters. The mom, Patrice Smith, is a second time author, who has previously coauthored a healthy living cookbook. She received a Bachelor of Science in Human Resources and Family Studies from the University of Illinois in Champaign-Urbana. The four adolescent authors are, Donna Smith age 14, Shannon Smith age 13, Charity Smith age 11, and Faith Smith age 10. They are all very active, school- aged girls with a variety of interests which include reading, drawing, singing, art and more. The inspiration for the book came from their real life mom’s summer writing assignment. This book is inspired by their real life, but it is a work of fiction. Be on the lookout for future works by these talented authors. 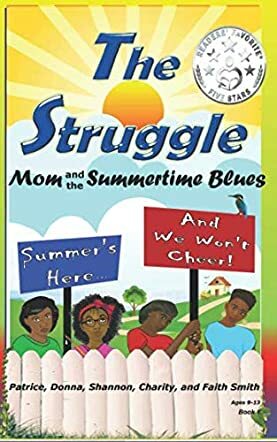 The Struggle: Mom and the Summertime Blues (Loving Our Lives) (Volume 1) by Patrice S. Smith, Donna Mittrecy Smith, Shannon Elaine Smith, Charity Elise Smith, and Faith Denise Smith revolves around four sisters - Shelia, Felicity, Diamond, and Crystal. Summer break is approaching and the four girls are dreading it because their mother makes them exercise, eat healthily, do household chores, homework, and other things which they find boring. They all have their reasons for preferring school over summer time. The four girls discuss the lessons their mother teaches them in a fun and humorous way, putting a smile on the faces of readers, and many readers will be able to connect with what they are saying. The sisters are all different and unique in their own way, but they all have something interesting to share about the life lessons taught to them by their mother. The black and white illustrations add to the appeal of the story and capture the emotions and the moods of the sisters and the story nicely. The author does an excellent job of blending the feelings of the adolescent sisters and their mother together effortlessly, making it a fun read for children. The sisters’ feelings and thoughts are real, relatable, and palpable, as is the case with the mother. Many mothers will be able to relate to the mother in the story. It is a good bedtime story book and excellent for interactive sessions in classrooms and school libraries. The discussion questions are good for youth discussions in class and will make children ponder on what they want in their lives and how they look at their lives. Readers will definitely be looking forward to the next volume to find out what the sisters are up to!